Madhvi Parekh was born in 1942 in Sanjaya, Gujrat. She is a self-taught artist. 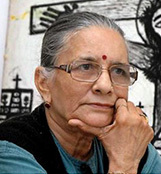 She started painting in 1964 and has held several solo shows and participated in several exhibitions including The Play: Exhibition of Six Painters at Indian Council for Cultural Relations in Istanbul, Turkey in 1985; Watercolors by Four Women Artist at New Delhi, Bangalore and Mumbai in 1987 - 1988 and A Critical Difference at Camden Arts Centre, London in 1993.